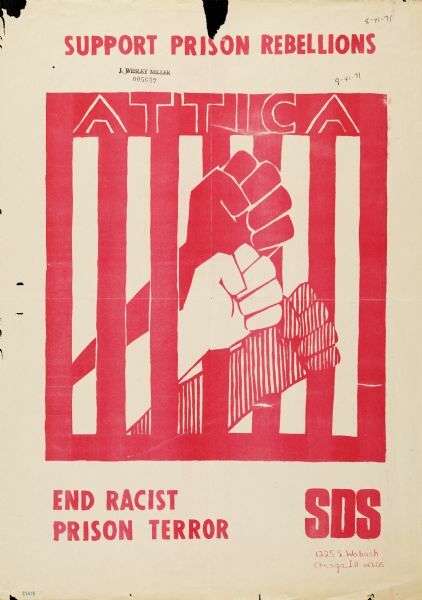 Image: Poster created by the Students for a Democratic Society (SDS) in support of the 1971 Attica Prisoner Uprising. This uprising is part of a long history of resistance to imprisonment from people inside, including the 1971 Attica Rebellion, and the 2011/2013 California and Guantanamo Bay prisoner hunger strikes. Just as PIC abolition follows in the tradition of the abolition of slavery, these acts of resistance are part of a history that includes Nat Turner’s Rebellion in 1831 and other resistance to slavery like work slowdowns, tool breaking, covert meetings, and escapes to free zones. We support the demands of the Holman prisoners and hold strong to our insistence that demands around poor prison conditions and crowding not be used as excuses to cage more people or build more new prisons for abolitionists to tear down later. Unfortunately, as the Holman uprising raged on we saw an Alabama Senate Committee preliminarily approve $800 million to construct four new prisons. We must organize against states, counties, and the federal government building more prisons and jails – that are temporarily less crowded before they are filled again – as a supposed solution to poor conditions. We must confront the inherently violent and oppressive condition of imprisonment and fight for alternatives to caging people altogether.